This was not your ordinary league title. Devotees of the obvious are free to point out that All-Irelands are not awarded at this time of the year. Yet this was one of those rare league finals with huge championship implications. Hence the unusual tension and intensity of a final quarter where both teams learned important things about their current standing. 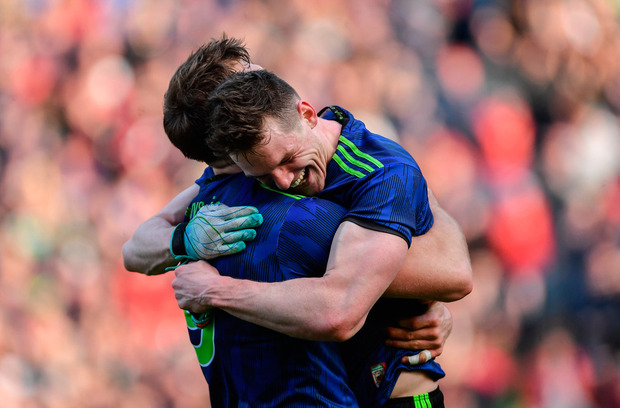 When, with injury-time beginning and the outsiders two points up, Stephen O’Brien cut in along the end-line and popped the ball up in front of David Clifford, it appeared as though there’d be a new addition to Ireland’s largest collection of hard luck stories. Instead Rob Hennelly made a remarkable reaction save and two minutes later a sublime through-ball from Andy Moran sent Ciaran Treacy galloping towards the Kerry goal. As if determined to spare nervously inclined Mayo fans further suffering, the Ballina forward swept his shot emphatically home. 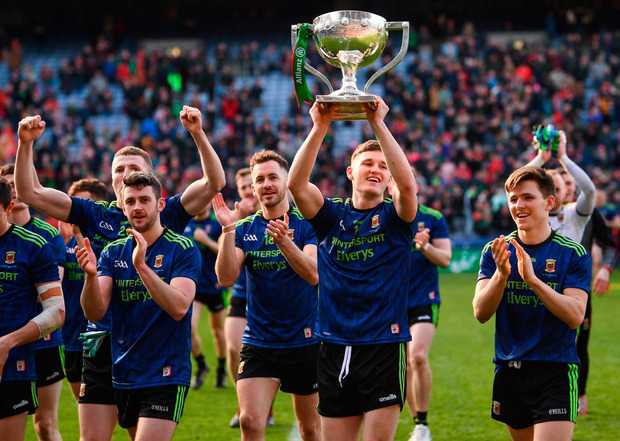 Mayo have been the masters of the courageous close shave, the moral victory and the titanic unrewarded effort in Croke Park finals. They simply had to win this one. It was as though they faced four different opponents at Croke Park. There was Kerry for starters. And also the burden of history, nine championship and league finals having been lost since their win in the latter competition back in 2001. At times they seemed to be playing against themselves. It is not in Mayo’s nature to make life easy. When they spurned a number of goal chances in the first-half and missed chances to draw level early in the second you wondered if their renowned capacity for self-sabotage would reassert itself. They had trailed at half-time despite spending much of the opening period on the front foot. Kerry’s two goals resembled a pair notched on the break by some Champions League outfit noted for counter-attacking expertise. 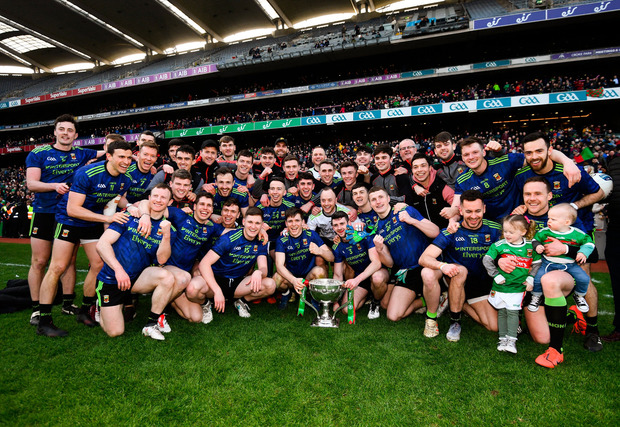 They evoked memories of the drawn 2016 All-Ireland final when Mayo’s first-half dominance had been set at naught by such concessions. Yet it was Kerry who would ultimately be stung by déjà vu. Diarmuid O’Connor’s goal yesterday seemed like a tribute to his goal in the 2017 All-Ireland semi. Once more a long ball dropped short, once more O’Connor’s courage and timing enabled him to beat a hesitant keeper and punch to the net. That wasn’t the only moment which brought 2017 to mind. Back then Kerry’s goalscoring ability kept them in the hunt, but couldn’t dispel the impression that there was more substance to Mayo. That was how it felt this time too. Their late scare notwithstanding, Mayo wouldn’t have been flattered by a seven or eight-point victory margin. James Horan has been in notably relaxed mood since his return to management. It seems like the attitude of a man confident about addressing unfinished business. The measured and thoughtful nature of Mayo’s football has the Ballintubber man’s fingerprints all over it. Horan has brought not just rejuvenation but reinvention. Over the past few years Mayo’s tendency to move Aidan O’Shea from pillar to post has had predictable consequences. Yesterday O’Shea was what he is cut out to be, and was during Horan’s previous term, a powerful, athletic and dominant midfielder, the driving heartbeat of his team. Looking at O’Shea clean Kerry out you wondered why he’s ever deployed anywhere else. Looking at James Carr, you wondered where he’d sprung out of. It takes some chutzpah to award a young corner-forward his first ever start in a match of this magnitude, but the gamble paid off big. The 22-year-old from Ardagh, one of those small junior clubs whose flag is rarely flown at Croke Park, played a major role in unsettling a Kerry full-back line that eventually disintegrated. Kerry, like Kilkenny hurlers, possess such a storied tradition that any sign of progress can be mistaken for a fully-fledged renaissance. It happened last year before Galway and Monaghan revealed the illusory nature of the new imperial garb. And now it’s happened again. All week sceptics were enjoined to have faith in the new improved Kingdom defensive system. But systems are only as good as the individuals they contain. The Kingdom’s cup is brimming over with young forward talent, but what they really need are new model Marc Ó Sés, Michael McCarthys and Tom O’Sullivans. It seems a long time since Kerry toughed out a result in a close big game. Mayo’s message to Kerry’s young tyros was, in the words of the Morrissey song: “You just haven’t earned it yet baby.” Peter Keane’s players can’t just flick a switch and establish themselves as heirs apparent. Mayo have the mileage done. The fourth opponent Mayo took on yesterday was the shadow of Dublin. This win restores them to the status of number one rival to the All-Ireland champions. Big deal. Keith Higgins, Andy Moran et al are hardly hanging on to add one more final loss to their resume. Three years ago Mayo might have beaten the Dubs had Rob Hennelly not made the most fateful fumble in football final history. In the first minute yesterday Tommy Walsh lofted in a high ball which Hennelly got underneath and flapped at. You feared for him, but after that his handling was flawless and his kicking crucial to O’Shea’s bravura performance, before the save from Clifford iced the cake. For an honest, gutsy player who must have doubted such an opportunity would ever come his way again this was redemption of a sort. But only of a sort. The real stuff isn’t available till August. Mayo’s return will make this year’s football championship 10 times more enjoyable than last year’s. It was a league final like no other because this is a team like no other. Gaelic football’s most heart stopping saga is back on your screens this summer for what promises to be the best season yet. SPOILER ALERT: This time there might be a happy ending.